» Where Do Squirrels Sleep? What do squirrels do during the night? Where do they sleep? So many questions and no answers! Every little creature has its own way to rejuvenate its body and enjoy a few hours of blissful sleep. Squirrels are no exception and their nature is fascinating. There’s no universal answer to the question where do squirrels sleep. Some of the species are nocturnal and they don’t sleep at all during the night. Some squirrels live in a nest, some have a den. The nests themselves are quire diversified in appearance and… well, comfort level. 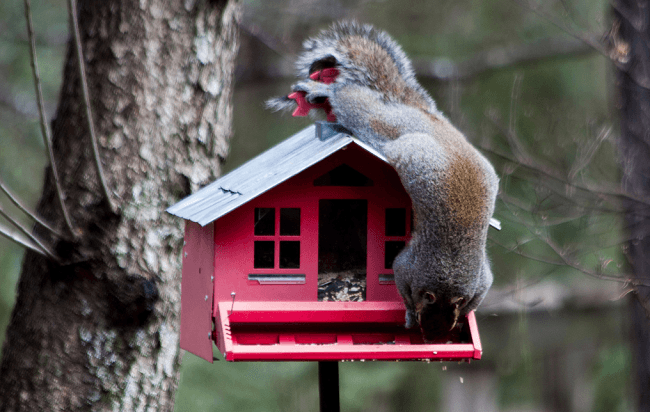 This tiny shelter gives the squirrel a shelter and it’s also the place where it sleeps. The type of nest is heavily dependent on the environment and the temperature of the habitat. Obviously, squirrels that live in a colder climate need a much more serious shelter from the elements. Tree squirrels and fly squirrels make their dens and nests of twigs, bark and moss. Leaves and feathers are used for bedding, giving the nest a bit of softness and allowing for quality sleep. Sometimes, these squirrels find the walls made by woodpeckers and they build dens there. A den is the option of preference for squirrels because it provides more shelter and it’s to be covered with other materials from fewer sides. Upon necessity, however, the squirrels can be quite crafty and they’re ready to begin working on the construction of a nest. Where do Ground Squirrels Sleep? The squirrels living high up in the trees aren’t the only species. There are ground squirrels and as the name suggests, they sleep below their tree-inhabiting counterparts. Ground squirrels make their dens underneath the surface. They dig in the earth and make their homes underground. Depending on the number of ground squirrels in the region, there could be an entire system of underground tunnels. The homes of ground squirrels are easy to recognize. Usually, there’s an opening and a pile of earth right next to it. the places that are inhabited by numerous ground squirrels are characterized by a big number of holes in the ground. Now that we’ve answered the question where do squirrels sleep, it’s time to take a look at the sleep patterns of the different species. Many species gather food and are active during the day. The red and the grey squirrel are two of these species. Such squirrels usually sleep during the night. When the weather gets cold and winter is coming, red and grey squirrels can be expected to sleep for a few days at a time. They’ll only wake up in the evening to eat or look for food. Flying squirrels, on the other hand, happen to be predominantly nocturnal creatures. They usually sleep and relax during the day. The flying squirrels will become active in the evening and they’ll remain awake throughout the night. When talking about sleep, it’s important to discuss two very intriguing behaviors that are known as hibernation and estivation. Hibernation is sleep during the cold winter months. Bears are probably the most famous mammals that are known for hibernation. 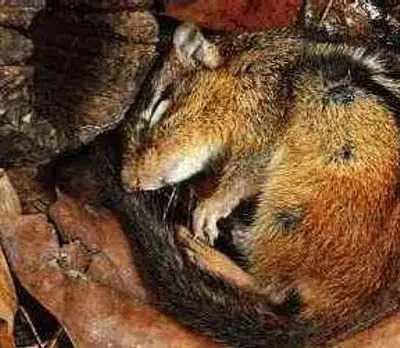 While the squirrels living in the trees aren’t known for sleeping during the winter, the ground squirrels will hibernate. Ground squirrels can sleep for up to seven or eight months. The number of months will depend on the gender and the age of the fuzzy little animals. While they are hibernating, ground squirrels get their body temperature reduced significantly. Their breathing, heart rate and metabolism are also reduced, bringing down the nutrients and resources needed to sustain the life of the squirrel. Estivation is something completely different. It’s used to deal with another extreme weather condition – heat. Estivation is a typical behavior for the squirrels living in hot climates. When the weather is most unbearable, the squirrels will retreat to their dens and they’ll sleep. Depending on the conditions, estivation can continue for a period of up to seven months. The next time you go out during the night, you should probably refrain from looking for a squirrel (unless the area is inhabited by flying squirrels). Cute squirrels enjoy getting their ZZZs during the night, just like humans do.